With forecasts of a snowy winter ahead, I’ve been curious about the city’s preparedness this year. When I moved here in 2006, everyone told me “it never really snows in Seattle.” But it snowed that winter, and the next two. In December of 2008, back-to-back storms actually paralyzed the city, which didn’t use salt to treat the streets. But Seattle seems better prepared now. 500 tons of raw salt brought from Canada are piled up under a tent at a city’s truck and equipment yard near Safeco Field. I saw it and sketched it yesterday. Robert Clarke, manager of maintenance operations for the city’s Street Maintenance Division, said if we run out of salt, the city has contracts to bring more. 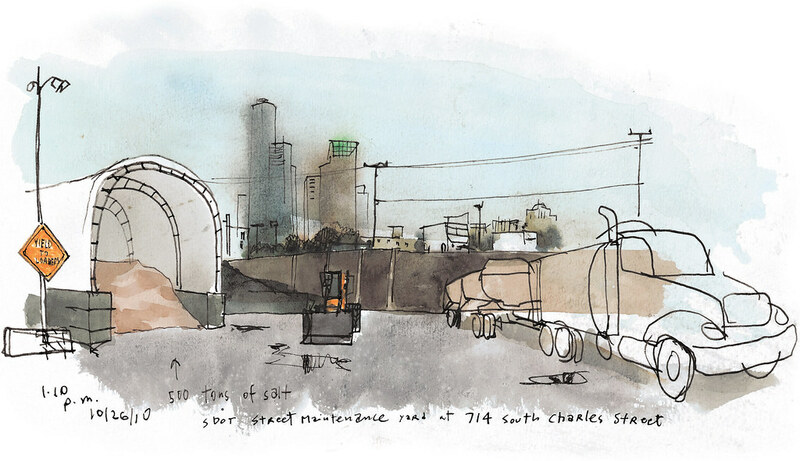 Stay tuned for a few more sketches from my visit to the city’s facility at 714 South Charles Street. Different agencies have launched a Take Winter by Storm campaign to urge people to be prepared. Check out their website for winter weather preparedness tips and resources.